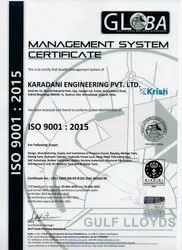 Established in the year 2012, we, “ KARADANI ENGINEERING PRIVATE LIMITED ” are widely recognized an one of the reputed manufacturer, supplier and exporter of premium quality array of Industrial Reactors, Vessels & Tanks. In addition to this, we offer S.S. Storage Tank, M.S. Storage Tank, Hydraulic Power Press Machine and many more. To ensure that our offered products are in-line with established quality standards of the industry, we manufacture these by making use of the high grade raw material, sourced from the trusted vendors. After the completion of the manufacturing process, we check these products by using latest technology so as to ensure their longer service life, less maintenance rust & wear resistance, precise design, fine finish, seamless shine and trouble free performance. Along with this, we are engaged in rendering Fabrication Service. We render Structure Fabrication Service, Induction Furnace Reconditioning Service, M.S. & S.S. Fabrication Service and Induction Coil Reconditioning Service. Offered fabrication and reconditioning services are known for their flexibility, cost-effectiveness and timely execution. In order to ensure the higher level of patron satisfaction, we provide them with the offered products as per their detailed specifications. Moreover, we render these fabrication and reconditioning services in accordance with the patrons' given details. We have appointed diligent and skilled professionals who help us carrying out all business processes within a streamlined manner. These professionals strive to cater to the varied requirements of patrons by making optimum use of all the resources. In addition to this, our professionals ensure to deliver these products at patrons' asked location within mutually agreed period. They also ensure to upgrade the installed modern machinery and latest technology at our infrastructure so as to ensure that we don't face any technical trouble during production process. Our infrastructure is well-connected to the nearby transportation modes. 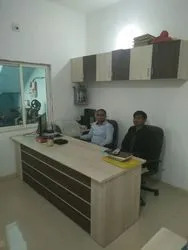 Under the excellent guidance of our proprietor, "Mr. Hardik B. Karadani", we are able to fulfill the varied requirements of patrons in a smooth manner. He has vast knowledge of this domain, business skills and optimistic approaches, guided by which we are able to execute all our business plans without any hassle. Manufacturing, Trading, Importer and Exporter of Rotary Autoclave, Hydraulic Power Pack, Tanks and Vessels. Backed by a team of experienced and dedicated professionals, We are able to attain all our business aims within pre-set time frame. Our professionals are well-abreast of the universally laid quality standards which they keep in mind while manufacturing Hydraulic Power Packs, Reactor, Pressure Vessel, Storage Tank, Reactor Hydraulic Power Press Machine and many more. Our professionals also take the responsibility of upgrading the machinery installed at our infrastructure due to which we able to carry out the production process in a smooth manner. 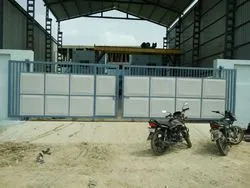 In order to carry out all our business activities without any hassle, we have developed a sound infrastructure at Ahmedabad, Gujarat (India). This infrastructure is spanning over a broad land mass and is fitted with all the amenities that required for the production process of Reactor, Pressure Vessel, Storage Tank, Belt Conveyor, Hydraulic Power Press Machine and many more. By making use of installed modern machinery, we are able to manufacture these products as per the specified details in a smooth manner. Our products are extensively demanded and appreciated in the market for the matchless quality features. The professionals in our organization are extremely experienced and are well acquainted with advanced market requirements and demands. Apart from this, there are various other significant factors that have enabled us to achieve this respectable market position.